Background: Protamines are the most abundant sperm nuclear proteins and pack approximately the 92-98% of the mammalian sperm DNA. In mammals, two types of protamines have been described, the Protamine 1 (P1) and the Protamine 2 (P2) family. The deregulation of the relative P1/P2 ratio has been correlated to DNA damage, alterations in seminal parameters, and low success rate of assisted reproduction techniques. 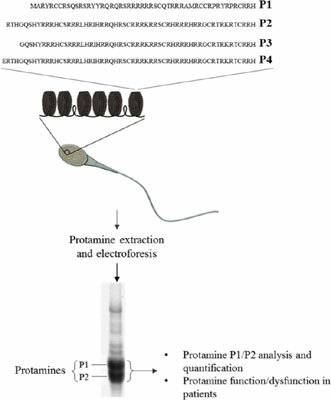 Additionally, the extraction and analysis of protamines have been important to understand the fundamental aspects of the sperm chromatin structure and function, protamine sequence conservation among species, and sperm chromatin alterations present in infertile males. However, protamines show a particular chemical nature due to its special amino acid sequence, extremely rich in arginine and cysteine residues. Because of these peculiar characteristics of protamines, their extraction and analysis is not as straightforward as the analysis of other chromatin-associated proteins, for which many detailed protocols are already available. Conclusion: A step-by-step protocol was needed to facilitate protamine analysis to researchers interested in their implementation. Therefore, in order to contribute to fulfill this need, here we provide a detailed protocol, which should be useful to research teams and laboratories interested in the protamine field. In addition, we also briefly review the different studies published so far on protamine alterations and male infertility. Protamines, sperm, protein isolation, male infertility, acid-urea electrophoresis, nuclear proteins, sperm chromatin.